It has just been a little over a week since the world’s cheapest Tablet ‘Aakash’ was made available for online purchase and it is already sold out. Techcircle got in touch with the spokesperson of DataWind Ltd (the company behind the Aakash and UbiSlate Tablets) and tried to answer some obvious queries for a tech enthusiast related to the most sought after Tablet in the Indian market. We had earlier covered the specs and what do you get in such a low priced product. Here we throw light on some important news such as UbiSlate to become available across offline and online retailers soon, DataWind’s upcoming more feature packed Tabs in the next six months and more. First of all, the move by DataWind to start selling Aakash online was surprising given that the Tablet was originally meant to be sold only to students while the relatively up scaled version UbiSlate was for the masses. But the company has clarified that its tie-up with the Indian government was for supply of 1,00,000 pieces as part of a public initiative for spreading computer literacy. Beyond that, DataWind was free to sell the Tablet to anyone on its own. But it had scheduled for just 30,000 units of the low cost Tablet as against demand for ten times that number, DataWind spokesperson Kumar Kundan Sharan told Techcircle. 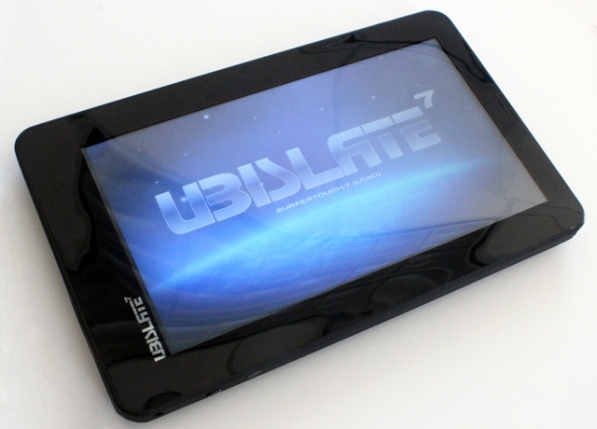 The company is claiming that it has received more than 1 million pre-orders for the UbiSlate Tablet which will be available to consumers by the last week of January, 2012. Come to think of it, if DataWind sells all those 1 million pieces, it would instantly become one of the biggest Tablet brands in India with revenues of over Rs 300 crore to begin with! Although this is not an apple-to-apple comparison, but Kindle Fire by Amazon that was positioned as a killer Tablet at a low price first started shipping on November 14, 2011 and is expected to sell around 5 million pieces in the fourth quarter. A number of readers had sent us feedback that even though they had pre-ordered the UbiSlate Tablet, they still haven’t received their booking ids and e-mail confirmations. The company has now clarified that the site is overloaded at the moment and hence there could have been a glitch, but the consumers will get their confirmations soon. “We are also re-designing the site and since the telephonic enquires have also been pouring in (their toll free number is busy most of the time), we are finalising a call centre in Delhi which should be functional by the end of next month,” according to DataWind spokesperson. The company is also shipping the Tablets internationally, however at a marginally higher price that is around $60 (approx Rs 3,200 as against Rs 2,500 in India. Blame it on the volatile exchange rate). Besides using its own production unit, DataWind has also given a sub-contract to Hyderabad based QUAD Electronics for manufacturing the Tablets in India. The company is also finalising two or three more production units in the country (most probably in Noida and Kochi, among other locations) that should be finalised by the second week of January, 2012. Another big question is that how is the company handling so many orders and how will the Tablets actually be delivered to the end consumer? The company says it has contracted a number of logistics companies like FedEx for international shipments and First Flight Couriers for India, among others, who will handle the logistics. If you have ever wondered why doesn’t the company charge a bit more for more power packed and feature laden products, the company has some good news. DataWind is also planning to launch new 7 and 10 inch Tablets that will have capacitive touch instead of resistive touch (as in Aakash and UbiSlate Tablets), and we can expect them to hit the market as early as Q2, 2012. These Tablets will definitely cost a little higher but they will still be cost effective and will provide the users with a Tabbing experience similar to the one provided by high end Tablets. For more updates on Tablets, keep track of this space. In just 14 days there are 14lakhs people booked it. I do not know when will I get it in my hand.